(Photo: © Peter Kenny)World Council of Churche's program on Spiritual Life Rev. Dr Mikie A. Roberts addresses an interfaith seminar at the Ecumenical Institute in Bossey, Switzerland on March 23, 2019. This year after setting off at the crack of dawn he had gone with Rev. Abhishek Prabhakar John, from India's Manipur Presbyterian Church and two other interreligious seminar students and the route was open. "The sun was rising slowly behind the mountain. The sun rays were shining through like they do in religious books. So, we did a joint prayer. There was a Muslim prayer and a Christian prayer. "By the time the Christian brother had finished the prayer the sun actually appeared from behind the mountain as the prayer was ending. There was a tremendous amount of symbolism in my view," which was a contribution to the greater understanding of God, said Hyjazie recounting their experience at the seminar's end. "This morning we went to the lake running; friendships are the beauty of this programme," said Prabhakar John. 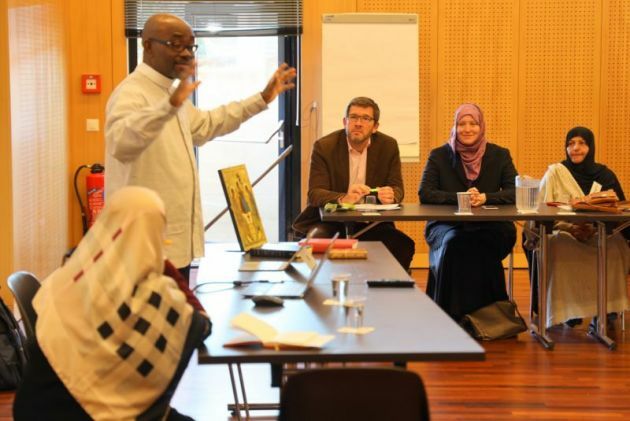 Prof. Lawrence Iwuamadi, academic dean of the Ecumenical Institute said after the seminar, "This was a first as the Bossey master's students who come from different Christian traditions and the visiting Muslim students shared the course together over the period. "Previously such groups would come, visit, and have their own courses, without any intentionally planned interaction with our students. "This new dimension is part of an effort to respond to the call of the pilgrimage of justice and peace, which invites to walk together with peoples of other faith. "It is no longer possible to deal with ecumenism in isolation, ignoring the interreligious aspect. The Ecumenical Institute continues to pursue this more holistic perspective on ecumenical formation," said Iwuamadi. One session was led by Rev. David Marshall, WCC programme executive for Inter-religious Dialogue and Cooperation; another by Dr. Katalina Tahaafe-Williams, WCC programme executive for Mission and Evangelism; and one by Rev. Nicole Ashwood, WCC programme executive for Just Community of Women and Men. Dr. Mohamed Shomali, director of the International Institute of Islamic Studies, London and Dr. Mahnaz Haydarpour, both of whom have many years working in interfaith engagements, gave presentations. Dr. Benjamin Simon, professor of Ecumenical Missiology at Bossey led a session titled, "Who is God? Introduction to Christianity." He was followed by Shomali, who helped him pull the course together, speaking on the "Word of God. Introducing our Scripture and the role it plays in our life." Shomali said, "We had a chance to know more about the diversity of the church. I hope that through this relationship we can expand our relations with our Christian brothers and sisters." Simon said, "This year we decided we should go more in-depth into theological topics like the understanding of God in the two religions, Trinity and incarnation in Christianity and the role of scriptures in the two religions, as well as spirituality. "It was so encouraging for the students as they were living under the same roof, sharing their meal times and sitting together. During leisure time they could walk down to the lake together or run there." Muslim student Yasmeen Al-Attar, a dental surgeon from Waterloo in Canada was happy that young people proliferated the seminar noting, "For me it meant almost a symbolic representation of a new manifestation of a spring of hearts, a spring of minds and a spring of openness, hopefully, a spring for a new beginning of this interreligious dialogue." Her brother, a family physician from Toronto added, "More important is the common thread that unites both religions, which is the belief in the oneness of God. It is a huge honour to be part of this, and I pray to God almighty that we are increasingly united in our action and our faith in one God." (Photo: © Peter Kenny)Moslem student Jihad Hyjazie from Mnotreal, Canada and Christitan student Rev. Abhishek Prabhakar John from India who studied, ran and prayed together during an interfaith seminar held at the World Council of Churches' Ecumenical Institute at Bossey Switzerland in March 2019.